Book from self-published Westbow Press author leads to job offer. One of the points I always make when I have an opportunity to speak at author conferences is you never know what can happen when you publish a book. So don’t let that manuscript sit in your drawer. Get it published and in the hands of readers. You won’t be sorry. 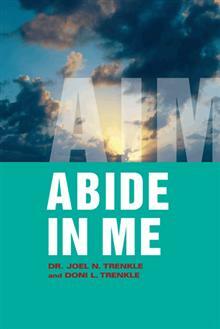 Recently, I came across the story of author Joel Trenkle, who published the book Abide in Me through Westbow Press. This is a great example of what can happen when you take the step to get published. His story first appeared on the Westbow Press blog. With permission, I have republished the blog post here. Now clearly, job offers do not come for every author who self-publishes, but it did for Joel. Perhaps his story will inspire and motivate you if you have doubts about self publishing. Enjoy. In our book, AIM, Abide in Me, I used areas of my own life to demonstrate how a person can walk through their own personal journey and see how God has been with them through the good times and the tragedies. At the end of each chapter, there is a section for personal reflection and meditation on the key point of each chapter, whether it be forgiveness, repentance, or celebration. A person in Denver, Colorado, gave a copy of the book to her parents and to her in-laws who live in Montana for a Christmas gift. I received a message from her mother-in-law, stating that her pastor was trying to retire and that they had not found a replacement for him. She said after reading the book, she thought I would be a good fit. My wife and co-author Doni and I prayed about this. We told her we would not want to have to explain to our Lord why we would selfishly not do something He asked us to do. We came to Montana and met the congregation. This was a forty-year-old church which had no ministries, no outreach; not even an e-mail address. I preached on two Sundays, and we returned to Colorado. We received a call asking us to come and shepherd this beautiful congregation. We sold our home and left Colorado, six children, and twelve grandchildren. We are happily serving our Lord and Savior, Jesus, at Dayspring Mission in Sheridan, Montana. → 7 predictions on what’s next for self-publishing.